The Dusky Warblers (Phylloscopus fuscatus) - also sometimes referred to as Dusky Leaf Warblers or Dusky Willow Warblers - occur naturally in Eurasia, specifically in Northeast Asia, West central China. Northern Asia, specifically in the Upper Ob and western Altai in Siberia east to Anadyr region and Sakhalin island, south to eastern Himalayas and central and north-east China. Northern India, Burma and the foothills of Nepal. Great Britain, Channel Islands, Ireland, France, Belgium, Netherlands, Germany, Denmark, Norway, Sweden, Finland, Estonia, Latvia, Lithuania, Poland, Austria, Switzerland, Spain, Portugal, Italy, Malta, Greece, Leningrad / Russia, Cyprus, Israel, Egypt, Morocco, Madeira. Typically found in shrub layers of open forest, in wet meadows, willow beds along bodies of water, taiga bogs and in upland thickets of dwarf birch. Wintering Territories Himalayan foothills of Nepal east to northeastern India, specifically the Arunachal Pradesh, Assam and Manipur regions; as well as Bangladesh, Andaman Islands and northern Burma / Myanmar. 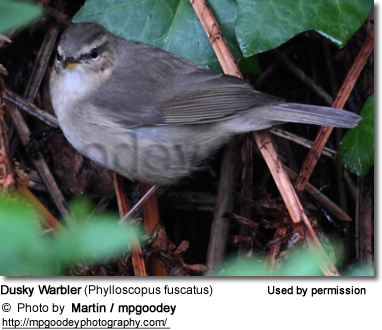 The Dusky Warbler measures 3.9 - 4.3 inches (10 - 11 cm) in length (including the tail) and has a wingspan of 6.7 - 7.1 inches (17 - 18 cm). The plumage is brown above and buff and grey-white below. It has a distinctive whitish "eye brow (supercilium). Slender legs. Spiky bill. Rather short, rounded wings. Immature birds have a more olive-tinged upper plumage. 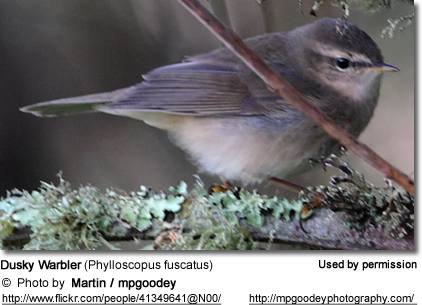 The Dusky Warbler resembles the Chiffchaff, but can be identified by the long whitish "eye brow" (supercilium) and the long, pointed bill. The Dusky could also be confused with the Radde’s Warbler but the former has a duller, darker and browner plumage, a finer bill and less prominent legs. Their diet consists of insects and some smaller food items, such as berries. They usually pick their prey off the ground. They build their nests low in bushes. A clutch consists of 4 - 6 eggs, which are incubated for about 11 - 13 days. The young fledge when they are about 12 -14 days old. These warblers typically only produce one brood a season. Its song is described as a monotonous whistles, and its call as harsh check.